FREE ESTIMATE. 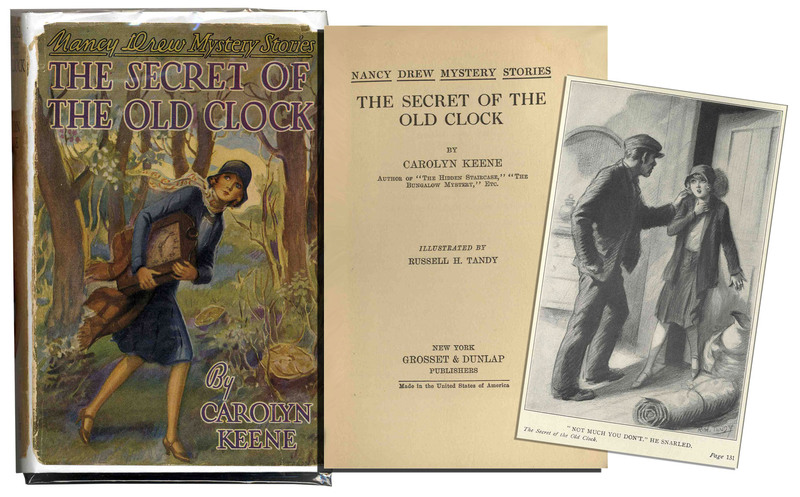 To buy, auction, sell or consign your Nancy Drew Secret of the Old Clock 1st Edition that is for sale, please email Nate@NateDSanders.com or call the Nate D. Sanders Auction House (http://www.NateDSanders.com) office at (310) 440-2982. 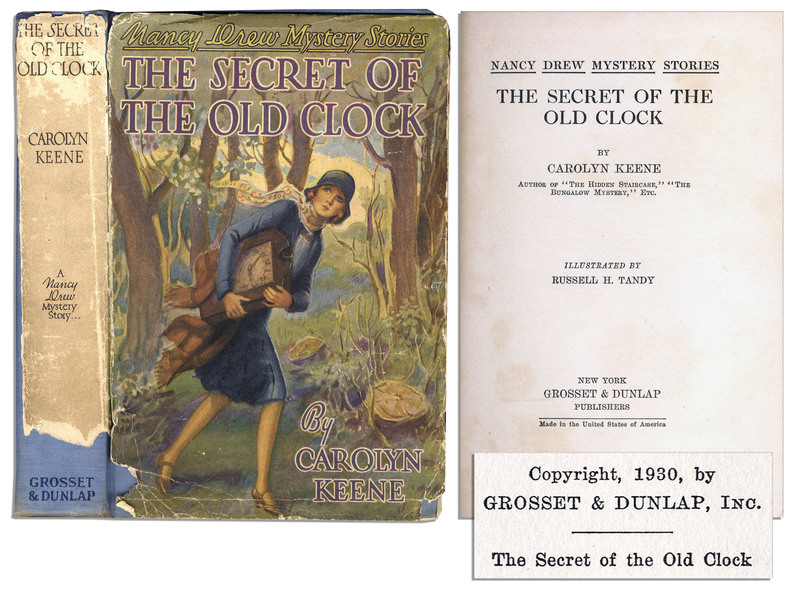 Please let us know if you have a Nancy Drew Secret of the Old Clock 1st Edition that is for sale. Top dollar obtained for your Nancy Drew Secret of the Old Clock 1st Edition. Nancy Drew, the young adult mystery series first published in 1930 by Edward Stratemeyer, is still a favorite among today’s youth nearly 90 years later. The book series was so successful that a film, “Nancy Drew: Detective”, was made in 1938 and in 2007 a modern film adaptation based on the Nancy Drew character was released. We sold a true Nancy Drew Secret of the Old Clock 1st Edition for $4,350, which can be seen below. 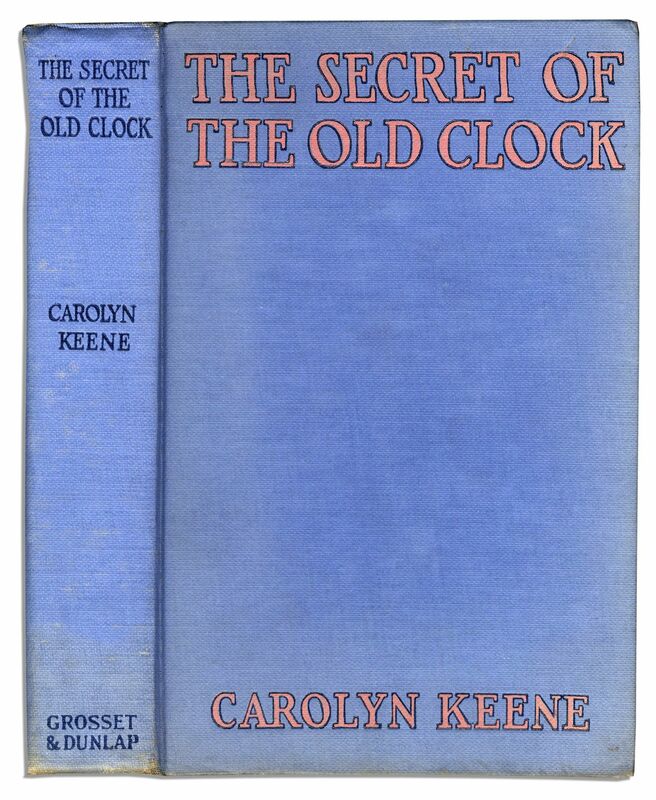 Very scarce first edition, first printing hardcover of Carolyn Keene’s “Nancy Drew Mystery Stories: The Secret of the Old Clock” with original dustjacket. True 1930A-1 first edition, as verified by Farah’s Guide, 12th printing. Grosset & Dunlap: New York: 1930. Illustrated by Russell Haviland Tandy. 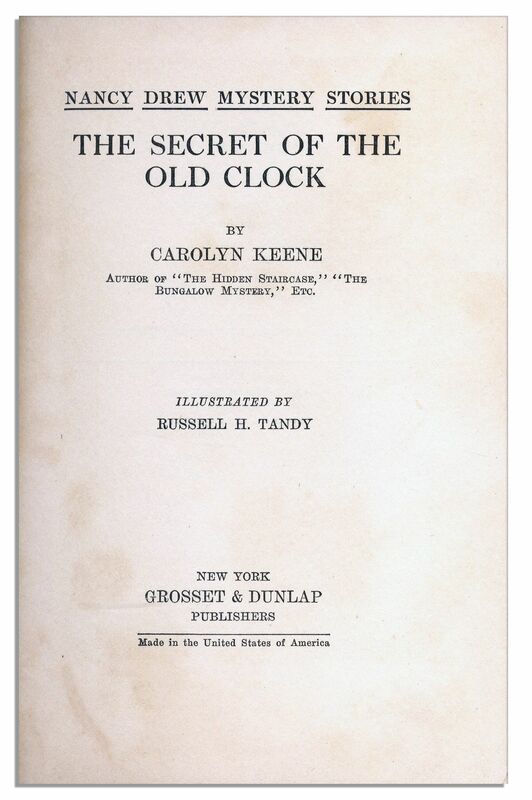 “The Secret of the Old Clock” is the first volume in the Nancy Drew series, written under author Mildred Wirt Benson’s pseudonym, Carolyn Keene. All first edition points present: (1) no silhouette of Nancy Drew on the dustjacket; (2) title lettering outlined in black on front board; (3) blank white endpapers; (4) a glossy frontispiece illustration and three glossy internal illustrations by Russell Haviland Tandy; (5) copyright page lists the first three books, “The Secret of the Old Clock,” “The Hidden Staircase” and “The Bungalow Mystery” which were printed around the same time as the start of the Nancy Drew series; (6) copyright page also states: “Other Volumes In Preparation”; (7) post-text ad page states: “This Isn’t All!” followed by ads for various series, including listings for 8 “Hardy Boys” titles, 11 “Ted Scott” titles, a “Famous Rover Boys” ad, 30 “Famous Rover Boys” titles, 33 “Tom Swift” titles, 9 “Don Sturdy” titles and 12 “Radio Boys” titles. Very light dampstaining to original blue boards and an inscription reading: “Bernice Jr. / From / Mother / Xmas 1930″ on front free endpaper. Hardcover book measuring 5.25″ x 7.75” is in very good condition. Scarce dustjacket is in good condition save for the split along fold. A rare opportunity to own one of the most coveted books in the highly popular Nancy Drew series. Sold for $4,350. 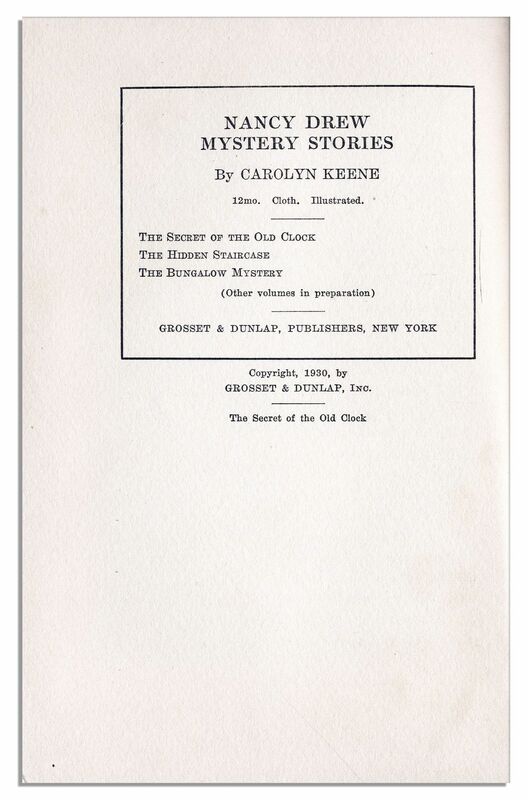 True First Edition, First Printing of Carolyn Keene’s “Nancy Drew Mystery Stories: The Secret of the Old Clock”. Click to enlarge. We also sold a different Nancy Drew Secret of the Old Clock 1st Edition for $2,431. Details are below. Obscure and coveted first edition, first printing of the first Nancy Drew mystery in the beloved world-famous series, with first printing dustjacket. 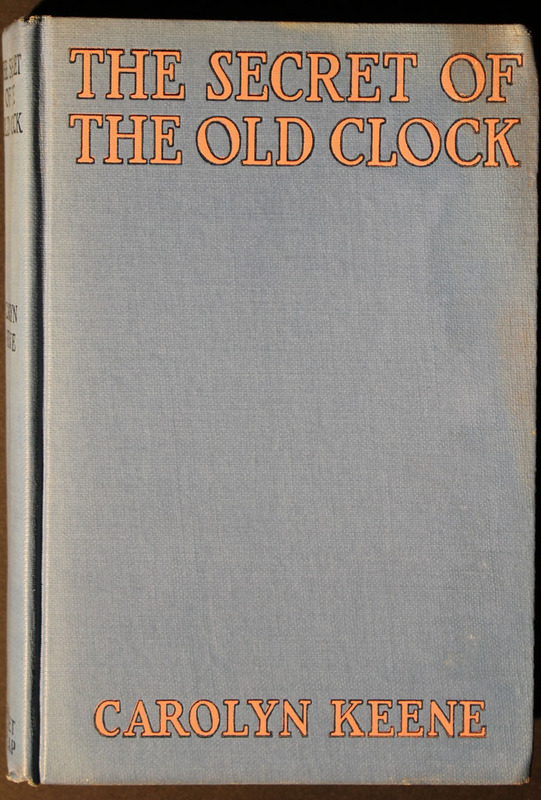 This is the premiere edition of ”The Secret of The Old Clock,” published by Grosset & Dunlap: New York: 1930. All the first printing points are present, including: (1) no silhouette of Nancy Drew on the dustjacket; (2) title lettering outlined in black on front board; (3) blank white endpapers; (4) a glossy frontispiece illustration and three glossy internal illustrations by Russell Haviland Tandy; (5) copyright page lists the first three books, ”The Secret of the Old Clock,” ”The Hidden Staircase” and ”The Bungalow Mystery” which were all printed at approximately the same time; (6) copyright page also states: ”Other Volumes In Preparation”; (7) post-text ad page states: ”This Isn’t All!” followed by ads for various series, including listings for ”Radio Boys” titles; (8) 33 Tom Swift titles on dustjacket reverse. Dustjacket features Russell H. Tandy’s illustration of Nancy Drew in 1920’s style dress as the first visual interpretation of the heroine. The mystery series revolves around the teenage detective, whose character and adventures came to define a plucky feminine ideal for generations. The books have sold more than 80 million copies worldwide. The concept was created by Edward Stratemeyer, who hired Mildred Benson to ghostwrite the first few books using the pseudonym Carolyn Keene. Over the years nearly thirty writers would craft Nancy Drew books under the same pen name. Runs 210pp. Bound in blue cloth boards measuring 5.25” x 7.75”. Previous owner’s name is inscribed to the front free endpaper. Toning and foxing to fore-edge, with light wear and sunning to board edges and spine ends, else near fine. The dustjacket shows overall toning and creasing to the hinges and edges, with paper loss to the spine base and chipping to the spine top. Good condition. Sold for $2,431. Nancy Drew Secret of the Old Clock 1st Edition. Click to enlarge.